Julie Made This: Who knew! Saturday morning I abandoned Dave and headed off to Coventry's Spinners, Dyers and Weavers Guild for their monthly meeting. 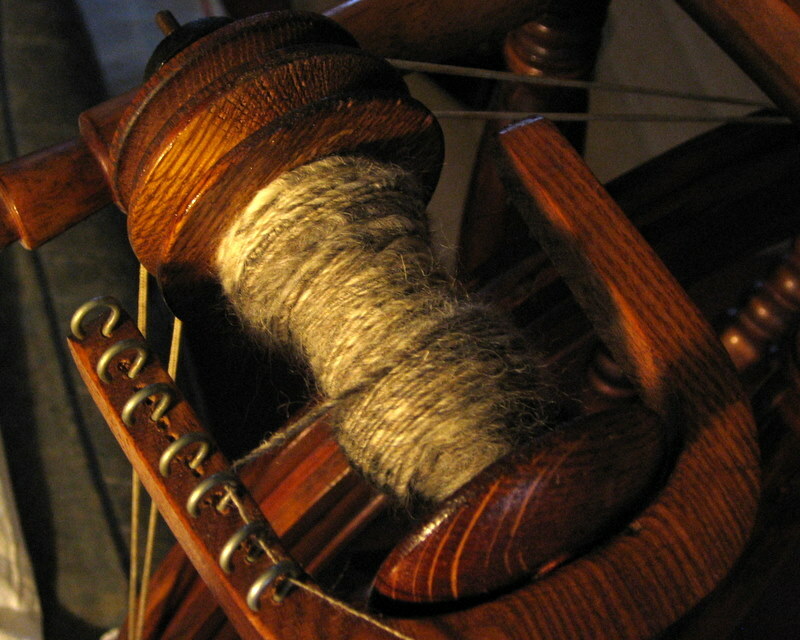 This time, I took along my spinning wheel to ask the ladies at the guild to look at it for me. I've had this wheel since May last year, but I've not really made much progress with her. I have managed to spin on her, but it's a bit hit and miss for me - although Christina borrowed the wheel last summer and reported that she 'rocked', so things obviously came together for her. With such a glowing report from Chris, my continued struggle to spin has becoming rather disheartening and the act of spinning very frustrating. I decided it was time to get another opinion and the combined vast experience of the guild seemed to be the place to go. Three ladies had a look at her for me and their prognosis wasn't good. Two ladies tried spinning on her, neither of them getting very far. One lady even went so far to blurt out that it was 'awful' after struggling to get anywhere for ten minutes. The verdict was that while the wheel was lovely to look at and well made, the spinning action of the wheel wasn't smooth, but juddery. They said that the wheel doesn't turn smoothly on it's axis and has a distinct wobble as well as moving in an elliptical fashion, possibly because the uprights are twisted. The double drive was a problem and adjusting it didn't seem to help, while it would spin it took in the single too quickly making it impossible to get enough twist in it and meaning you need to draft very quickly or the single snaps. These dear ladies tried, but what they were saying matched my own experience and proved that it wasn't just me being not cut out for spinning on a wheel. The prognosis was that it really needed to be taken to a spinning wheel expert for some serious TLC. I had tales of how some wheels are tempermental and only work for specific people (explaining why Chris got on so well) while some perfectly good wheels will not behave when certain individuals go near them. Choosing a spinning wheel is a very personal thing, so I am told and sometimes a wheel chooses you - which sounds awfully like a cat to me! In some ways these words of wisdom and advice were a relief to hear but in others, disappointing. After all those months of struggling to get anywhere, I was hoping the guild ladies would wave a magic wand and the wheel and I would suddenly be on the best of terms. Sadly, it was not to be so. My wheel sat in the room, surrounded by dozens of other spinning wheels all whirring away while people tutted over my poor baby and then a lady called Alice offered to lend me a wheel. Needless to say I jumped at the opportunity and yesterday morning (Sunday) I headed off to collect my soon to be borrowed wheel. Alice had got the wheel, an Ashford Traditional, out and dusted her off ready to use. She showed me how to set her up, demonstrated how a wheel should turn on its axis... i.e. no judder, no wobble, no up and down movement, it should just go around and around. She showed me now easy treadling should be (really, it should be) and then, sat me down and told me to have a go. And then I put the fluff near the leader, joined it as if I'd been doing it all my life and started to spin. And that was it. It worked. My hands obviously knew what they were doing. I was drafting without problem and perfectly spun single with just the odd bit of blobbiness was feeding through onto the bobbin. 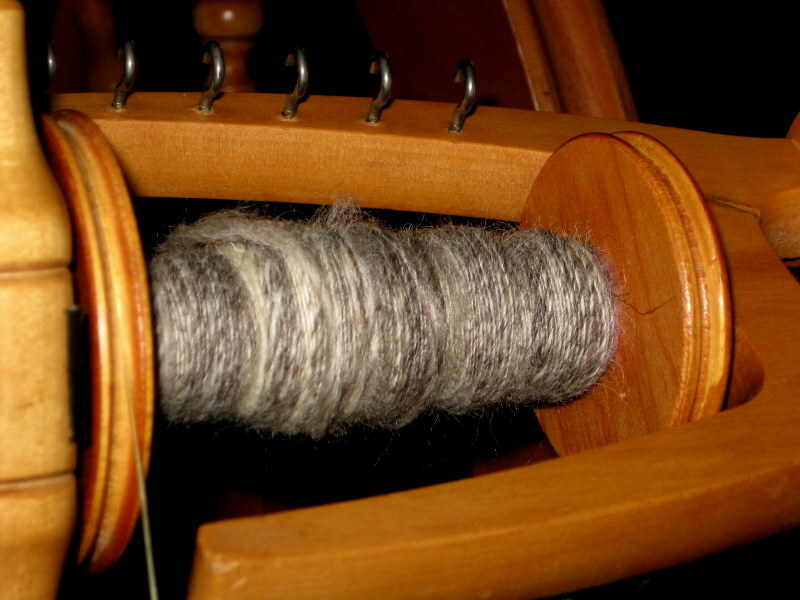 I knew I could spin on a spindle, but it now turns out that after month after month of struggling, I also know how to spin on a wheel but my results were so poor that I hadn't realised it. Half of spinning is muscle memory, that is your hands need to learn how to draft and hold the fibre, how to keep the tension in the spun single and how to stop the spin travelling into your fibre store... And my hands know how to do this. Who knew?!!! My most successful single spun on my wheel in about two and a half hours. If you compare the quality of the single, the one from my wheel is no where near so well spun or even as the one from the borrowed Ashford. There was no battle. No fight with the borrowed Ashford. I just sat there and spun. Who'd have thought it would be so easy? will this let me post now? Yay it will! tried the other day w no joy?? Is the other wheel on permanant loan then? sounds great, will you get the older one repaired? or just use for display? ?